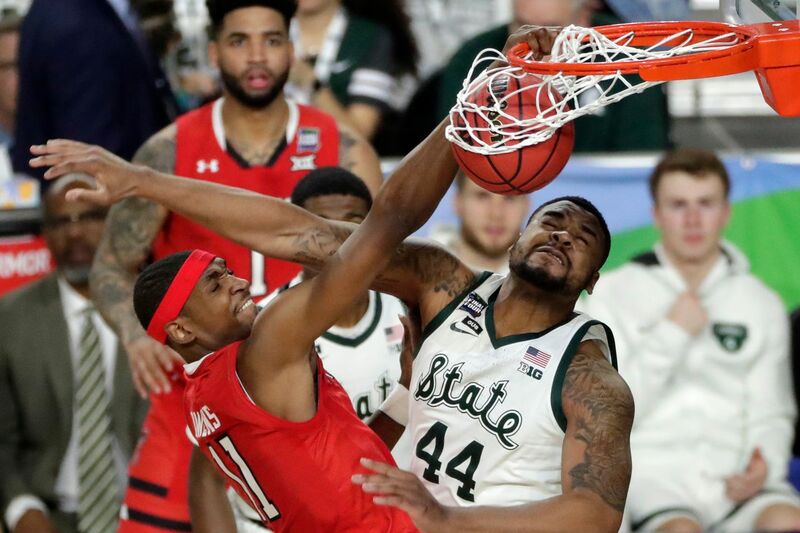 Vegas Vic is gonna ride Texas Tech, as long as forward Tariq Owens, shown here dunking against Michigan State in Saturday's national semifinals, looks OK during warmups. Inquirer handicapper Vegas Vic picks tonight’s national championship game. So what’s the guy with $300,000 riding on Texas Tech going to do now? LAS VEGAS -- Double V is looking to finish the college hoop season with a hat trick after cashing both tickets at the Final Four on Saturday. At this point, I’m gonna roll with Texas Tech and take the +1.5 points, but with a caveat. Watched the Final Four with my son-in-law, who is not a basketball savant, and he asked what was up with Tech’s defense. The only word I could respond with was FEROCIOUS! Everyone talked about Michigan State’s D and how tough they were, but the Red Raiders were the Spartans times TEN! Never stopped moving, switching and every time a Sparty had the ball, they were ALWAYS double-teamed. Didn’t think they could keep it up for the entire game, but they did. Chris Beard used a seven man rotation, but I’m a little worried about Tariq Owens. The big man tweaked his ankle and while he is listed as probable, he might not be able to eat double-digit minutes. That could put a crimp in Tech’s style, especially if they get in foul trouble. Another thing that worries me is the Cavaliers coming in with a GIGANTIC chip on their shoulder. They’ve been on the revenge tour since the tournament started, trying to wash away the horrible taste of last year when they were the FIRST EVER men’s No. 1 seed to get bounced by a No. 16. And now, everybody’s all like, the Cavs got lucky against Auburn, the refs were blind, they shoulda never won. You know what they say about a wounded/disrespected animal. So, you can see I’m conflicted. Not gonna step out too big on this game, and gonna look REAL close at the Owens ankle when they warmup. If he is running free, it’s guns up with the Raiders, but if he’s limping around, then we might take out the saber and roll with the Cavs. It’s a game-time decision baby, but most likely, $55 to win $50 on Tech. » Virginia’s overall spread log sits at 25-12, 15-6 on the road and 23-12 as a favorite. » Texas Tech’s overall spread log sits at 20-16-1, 12-7 on the road and 5-3 as an underdog. According to their mobile apps as of Monday afternoon, the money-line prices for SugarHouse and Parx differed enough that big bettors in Philadelphia should consider SugarHouse. Parx’s money lines for Virginia was -137, and for Texas Tech it was +107. At SugarHouse, those numbers were -127 for UVa and +114 for Texas Tech. For those playing 50 or 100, the difference is only a few bucks. For those dropping multiple dimes, betting the Texas Tech ML is worth an extra 70 bucks per 1,000 wagered. For Virginia, that extra 10 bucks between Virginia -127 and -137 is an extra $100 per $1,000 played. FanDuel (Valley Forge Resort) and Harrah’s (Chester) each had money lines of Virginia -125 and Texas Tech +105.